JT’s Manukan Grille has become a landmark in the Greenhills-Gilmore area and favorite destination especially of hungry night owls. This is where musicians go for after-gig dinner and drinks, including members of the band Color It Red, which was one of the guest performers at JT’s recent 15th anniversary party hosted by its Bacolod-born owner, actor Joel Torre. I personally had to ask Torre himself if it’s really just 15 years ago since he put up JT’s, because I thought the place had been around longer, like since the 1990s. “May 3, 2003,” Torre messaged me. Chickoy Pura and Dwight Gaston perform at JT’s Manukan Grille. 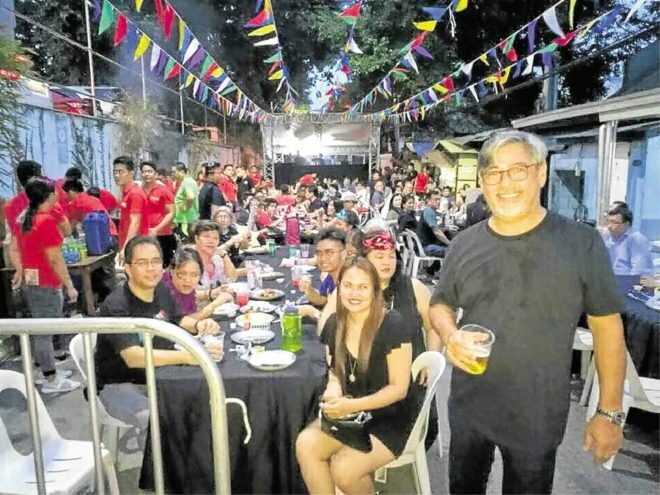 At the party, JT’s—which has successfully grown with 20 branches—resembled a festive neighborhood eatery teeming with merrymakers led by Torre, who mingled with guests while sipping San Miguel Beer from a plastic cup. The Jerks frontman Chickoy Pura jammed on hits by The Police, The Doors and other classic rock acts, as well as originals, accompanied on congas by Torre’s fellow actor and Bacolod townmate Dwight Gaston. More friends, mostly from Torre’s close-knit actors’ circle arrived: Jaime Fabregas, Mitch Valdes, Ronnie Lazaro, Audie Gemora, Art Acuña, plus Boyet Sison, among others. At a table sat Bembol Roco and Richard Merk, who came with friends Al and Lai Enriquez. As the music played on, the beer flowed and the fun lasted till the wee hours. The Smoking Joint (TSJ), a dine-and-drink place in Makati known for its “low-and-slow” method of cooking ribs and brisket, has branched out to Tagaytay with a different name: The Campfire Grille. TSJ owner Tony Fernando says Campfire has a similar concept, except that it has a real grill at the tables where customers can do their own barbecue. Campfire’s specialty, incidentally, is Corned Beef Bulalo which is perfect for the cool weather in Tagaytay. The Campfire, like TSJ, will also feature live gigs. The Bleu Rascals played last night.